We drove out from the Fitzgerald River NP through the most delightful native garden. Pea flowers of every colour..yellow, pink, mauve, blue, orange and red. We stopped several times to look closely and to photograph. Of course I can only identify a few as there are so many new flowers for us. Banksias and wattles are quite plentiful. 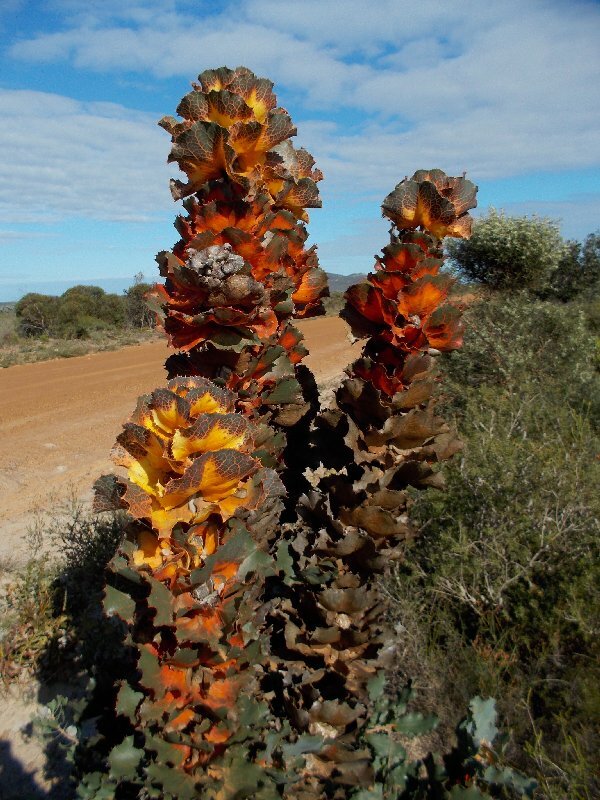 However the most spectacular was the Royal Hakea..Hakea victoria which was named after Queen Victoria. 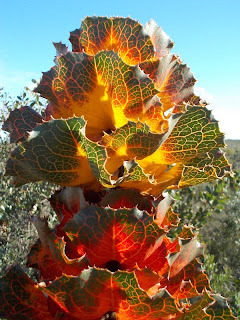 The actual flowers are insignificant but the huge floral leaves dominate the bush. These leaves persist for up to 5 years, and the colour becomes deeper each year. Late in the day we found a Square Fruited Mallee Eucalypt tree.The buds, nuts and flowers are large about 5 cm in length by 3 cm wide. The flowers and buds are bright red. I do hope we see some more of these. Again we will sleep with the sound of waves in our ears. We are at Munglinup Beach on the Great Southern Ocean.